Every now and then, you might get some files from a friend or family member. Maybe they e-mail them to you, or maybe you copy them over via a USB stick. In any case, the files are often compressed, like in a ZIP file. So, you dutifully double-click the file, extract it, et voila! You’ve got the files. 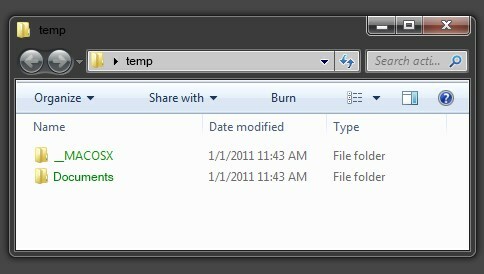 There’s only one problem: the extracted files’ and folders’ names are displayed in green text. Okeydokey. Most often, this happens when you get some compressed files from a Mac user. Notice the extra (and completely useless to you) __MACOSX folder. You can safely delete this folder. Nevertheless, you’ve still got a green folder left. 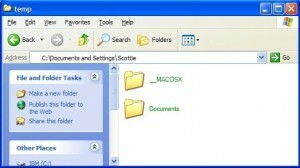 It seems that the reason this folder is green is because Windows has encrypted it for you. Why on earth would it do that? Well, it’s all related to OS X and file and folder encryption, and Windows doing something semi-stupid when it decompresses said files given to you by your buddy. In short, Windows seems to re-encrypt the files for you on your system, and thus they appear green in Windows Explorer. Even if you aren’t using any of the built-in Windows encryption shenanigans, it still does this. Annoying, eh? What’s worse, the next time you reboot, you may get a lovely little reminder that you should save your Windows encryption key to a USB stick, and until you do so, it’ll keep harassing you. Well, just save the darn key file somewhere to make it happy. 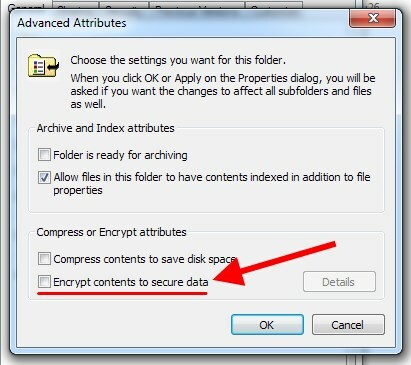 In the Advanced Attributes window that pops up, UNcheck the “Encrypt contents to secure data” checkbox. Click OK, and when it asks if you’d like to apply this change all files in the folder, say yes. That’s it. When it’s done, your folder/files will no longer be green, they will no longer be encrypted, and all will be right with the world. An extra tip: In the above image, note that there’s also a checkbox for “Compress contents to save disk space”. If you check this box, the contents of the folder will be compressed (which is pretty useless and generally makes things slower). Compressing a folder will make it appear as a blue folder in Windows Explorer. So, there you have it: You can now make your green and blue folders normal again! 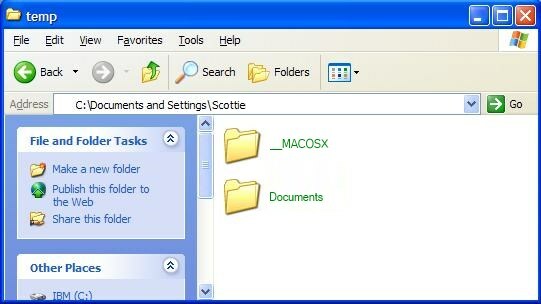 I’ve been struggling with those “green folders from Mac users” for a while, and your tip not only presented the easy solution, but it also explained in layman’s terms what’s going on. there is problem in my computer suuddenly some of my files & folder came in green words and after that i can not open.more over i can not make copy or delete them . This did not help me at all. It tells me “error occurred applying attributes to the file access denied” but I know I am the one who owns this file. How do I fix this? Thankyou so much,you helped a lot. This works only if you are the owner of the files and folders in question. If the SID does not match there is literally nothing that can be done short of formatting the drive to get rid of them. The owner must login to make the change and LSASS must not have the file locked open. If I copy files from another drive, or extract them from a ZIP or RAR, I should be the owner, no? In any case, I’ve never encountered any ownership problems when dealing with “green folders” from whatever source. YMMV! Seriously nothing can be done with them period. sir i did as u said but while i am getting notification that access is denied. since i used folderlock my file stopped working with green name. My photos and videos and some files had been encrypted and greened before I updated my windows to 7th version and I did not understand. Now I don’t know how I can access them. Would you please help me to access them solve theproblem? Thanks a lot and I am waiting to hear about you soon. I’m afraid that I don’t know of any software that will break the encryption. Without the certificate/key from the old version of Windows, you might be in big trouble. I’m actually surprised that Win 7 didn’t automatically detect and import the key, but that’s Microsoft for you… Anybody else know of a trick?? Just to clarify, Windows is NOT encrypting these files. When an Apple computer creates a zip file, because it is UNIX based, it flags things differently, causing Windows to think it is encrypted. Aha! Good to know. Thanks! Of course, that still means Windows says they are encrypted, and thus the solution presented here does actually work. Which is nice. All those steps field what do i do next. This can not be copped or opened and the are in green. I was having this issue on the shared drive of a small business network that includes a domain. As the domain administrator and owner of the encrypted files, I still couldn’t unencrypt them (access denied). I had to ask around for the user who uploaded the files into the shared drive from an outside source in the first place. Using their user profile allowed me to unencrypt the data. Thanks – Fixed the issue with website background image rendering. 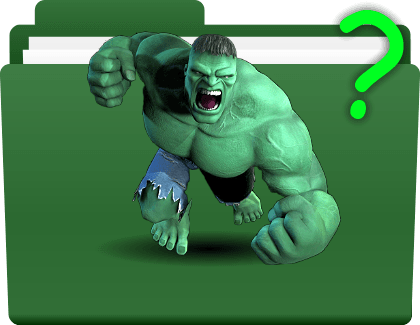 Windows Green Files – no can do!